When the cast of Star Wars: The Force Awakens was announced last April, there were many who were disappointed to learn that Billy Dee Williams was not listed among the actors. Although he did not appear in the original film, A New Hope, Williams (and his alter-ego Lando Calrissian) has made such an indelible mark on the franchise that it seemed a little odd to many that he was not included. So when starwars.com‘s “Rebels Recon” announced that the next Star Wars Rebels episode would be entitled “Idiot’s Array,” fans of Lando Calrissian became very excited as the phrase refers to a winning hand in the card game Sabacc. For not only is the game frequently associated with the charming smuggler, but it also was the impetus behind Lando losing the Millennium Falcon to Han Solo (as referenced in The Empire Strikes Back). Therefore, it is really no surprise that “Idiot’s Array” opens up in Old Jho’s Pit Stop where a Sabacc game is being played between Zeb, a Rodian, and another figure cloaked in shadow. In another part of the cantina, Kanan and Jho, the Ithorian owner and bartender, are discussing the difficulties of finding work for the crew of the Ghost. It seems that the third member of the Sabacc game might have an opportunity for Kanan as Jho relates that this stranger is looking to hire a ship and a crew. As Kanan makes his way over to the card game, Zeb is feeling confident in his hand–so confident that he even bets Chopper. But unfortunately for him, the eponymous “Idiot’s Array” is played by the stranger who, after winning the pot, reveals himself to be none other than Lando Calrissian. As Jho suggested, Lando is looking to hire a starship and its crew to move cargo past the Imperial blockade surrounding Lothal (it isn’t revealed in this episode whether or not Lando has already lost the Millennium Falcon to Han Solo, but it seems likely). Now the proud owner of the Ghost’s astromech, Lando convinces a sheepish Kanan to introduce him to Hera in order to confirm the details of the operation. The Twi’lek captain is none too happy with the situation since Zeb and Kanan bet and subsequently lost Chopper (whom she sees a member of the crew) in the Sabacc game, and her assertion to Lando that “no questions asked” costs a little more calls to mind the negotiations between Han Solo and Obi-Wan Kenobi in A New Hope. Even though he claims that he and Kanan had already agreed on a price, Lando is amenable to Hera’s demands and immediately attempts to ingratiate himself with the rest of the crew. Chopper actually seems to like his new master very much and happily performs tasks for him that normally require continual prodding from Hera or Kanan. But none of the rest of the crew–with the exception of Sabine–seem to be buying what their employer is selling. 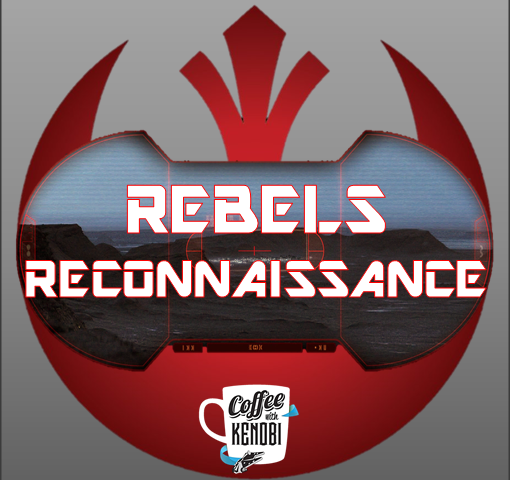 Kanan and Zeb are still upset about the Sabacc game, Hera is more than a little put-off by Lando’s presumptuousness and smarmy nature, and Ezra resents the way Lando has taken in interest in Sabine’s art (and the artist herself). Speaking of that, the behavior of “old smoothy” in regards to the underage Sabine comes off as a bit creepy, but thankfully it is short-lived. Rather, it seems like it is merely a means of making Ezra jealous–which drives the plot forward a bit later on. Speaking of the plot, it is revealed that Lando hired the Ghost and her crew in order to facilitate the purchase and transport of some “sophisticated mining equipment” back to Lothal. The “mining equipment” in question is actually of an organic nature–a puffer pig sold to Lando by an alien crime lord named Azmorigan. Voiced by the always entertaining James Hong, Azmorigan’s design is actually taken from some of Ralph McQuarrie’s original designs for Jabba the Hutt. Not surprisingly, Azmorigan shares many of Jabba’s traits–including a fondness for Twi’leks which Lando hopes to exploit with Hera’s begrudging assistance. Having made a bargain to trade the Ghost’s captain for the puffer pig (without Hera’s knowledge), Lando partially redeems himself by assisting Hera’s breakout through the use of less-than-subtle hints about the ease of accessing the escape pods on Azmorigan’s ship. But as we soon see, Hera needs little help as she dispatches her captors easily with the help of a very useful tray. Ultimately, she returns to the Ghost with minimal effort, but the punch she gives Lando when she next sees him reveals that all is not quite forgiven. As the Ghost makes her way toward the Imperial blockade of Star Destroyers, “Idiot’s Array” calls to mind the rebel penetration of the Endor shield in Return of the Jedi. More than a stolen clearance code is needed this time however, and the producers of Rebels choose this opportunity to show the Ghost’s signature modulator in action. Through the use of this modulator, the Ghost becomes the Tontine–at least to Imperial sensors–and it seems that our heroes might make it to their destination relatively unscathed. But as Princess Leia would remind us, “It’s not over yet.” The puffer pig, it seems, is a sensitive creature and is easily frightened–which has caused it to expand into a bulbous barricade that has separated Hera from the cockpit of the Ghost and left Kanan to pilot the starship. Further aggravation of the pig by Ezra (who attempts to climb over the pig to disrupt Lando’s conversation with Sabine) results in a greater expansion of the creature, which in turn results in Zeb’s accidental deactivation of the signature modulator and a subsequent pursuit of the Ghost by Imperial TIE fighters. Fortunately, Kanan is up for the task, and by following Hera’s advice about using cloud cover, manages to evade and ultimately destroy the TIEs. In the process, he also gains a new appreciation for Hera’s piloting skills. Throughout “Idiot’s Array,” Lando has been proclaiming how lucky he and the rest of the Ghost’s crew are to have Hera as their captain. Before this point, Kanan clearly resented Lando’s self-inclusion in those statements, but now he finds that he has no reason to argue–regardless of who’s talking. Finally returning to Lothal, Lando and his escorts make their way to a settlement the former had earlier purchased from Cikatro Vizago. There, the puffer pig (as a sort of truffle pig) will be employed to sniff out valuable raw materials that Lando will use a source of income. But one more obstacle remains as Azmorigan reappears and demands that the pig be returned and the Ghost and her crew be included as compensation for his troubles. Never ones to go quietly, Kanan, Hera, and the rest choose instead to fight it out with Azmorigan and his minions. The battle is brief and one never feels that our heroes are in any real danger. There are some fun character moments here with Sabine reminding us of her incredible Mandalorian athleticism and marksmanship and especially with Ezra revealing to Kanan (and the audience) that his newly constructed lightsaber doubles as a blaster–another thing Kanan’s lightsaber doesn’t do. In fact, the overall tone of “Idiot’s Array” exudes a sense of excitement and adventure but very little menace–which is fitting considering the episode features one of the smoothest characters in the entire galaxy. In the end, it’s Chopper who saves the day by making his way to the Ghost’s turrets and overpowering Azmorigan and his men. A tenuous truce is achieved, and although Kanan and Ezra are severely tempted to let the crime lord have Lando after all he attempted to get away with, their honor wins out and Calrissian is allowed his freedom. He reveals that he doesn’t have the money to pay them, but since Chopper has already stolen a large fuel canister from him, everyone parts amicably. After saying goodbye to the Ghost and her crew, Lando remarks to the puffer pig that he knew about the stolen canister and that “a gambler never shows his cards.” Whether or not that’s true, it seems likely that since Lando Calrissian has invested in a potentially lucrative mining operation on Lothal, one of our favorite scoundrels just might make future appearances on Star Wars Rebels. Here’s hoping. Previous article Becca's Chava Chat: So Love Has Blinded You?